Researchers predict that more than half of us will own a smartphone by the end of the year, and even people who consider themselves tech-shy probably have an ordinary cell phone in their purse or clipped to a belt. Not just for texting or surfing the net, these devices are at the cutting edge of the way we interact with our financial institutions. A rapidly growing number of activities you can do in person or via a phone call can now be accomplished - sometimes faster, because there's no waiting in line or on-hold time - with a few taps of the keyboard on your cell phone. In fact, five years from now, Javelin Strategy and Research predicts that 86 million of us will use our mobile phones to conduct our banking activities. WalletPop contacted the nation's biggest banks to find out a little more about the applications, alerts and other tools that are bringing banking into the 21st century.Representatives from Wells Fargo, Chase, Citi and Bank of America provided WalletPop with a rundown of their mobile services, and experts both within those banks and in the industry at large offered some thoughts about the growth of mobile banking and predictions about this channel's future. "We're very focused on having a tool for [consumers] regardless of where they are from a servicing perspective," says Tracey Weber, managing director of internet and mobile banking at Citi. Using text messaging to access your bank information is something you don't need a fancy phone with a lot of bells and whistles to do; any mobile phone with texting capability works. Customers can generally sign up either online or on the phone. Once the system has your cell phone number connected to your account, you can send SMS or "short code" requests to obtain information like your balance or recent transactions. Christine Holevas, a Chase spokeswoman, says a service that will send alerts to customers if their balance falls below a pre-set amount is popular with users. "A lot of customers are really jumping on the bandwagon using the alerts," Holevas says. Customers can reply back via text to transfer money into their accounts to avoid overdrawing their accounts or having a payment rejected due to insufficient funds. If you own a smartphone, such as an iPhone, you have several different options when it comes to mobile banking. First of all, you could use text-message notification the same way as someone with a standard cell phone (which might not be a bad idea if you have a plan that gives you unlimited texting but limits your data use). You can also use the browser on your phone to access the bank's website. A growing number of banks both large and small have special, mobile versions of the website you'd access from your PC at home. The website can tell if you're coming to it from a phone, and it will automatically load the mobile version. Generally, the mobile versions are set up to do most of the same stuff as a full-service website, but they cut down on the amount of zooming and scrolling you have to do. Other types of businesses, such as department and hardware stores, offer these kinds of mobile-optimized experiences, too. In addition, all four of the big banks we contacted offer mobile applications for popular smartphone software platforms like iOS, Android and Blackberry. Apps can be designed to act as a "doorway" into the bank's mobile website, or they can be stand-alone tools via which customers can do thing like check a balance, pay a bill or transfer funds. The bank reps with whom we spoke all emphasized that these new tools don't replace in-person or online banking; rather, they're best used in conjunction with more traditional methods of managing one's money. "In general, in financial services, there's heavy cross-channel utilization," says Citi's Weber. "The amount of engagement customers have is promising," Wells Fargo's Watson says. "[Mobile banking] really allows customers to be continually in touch with their finances." 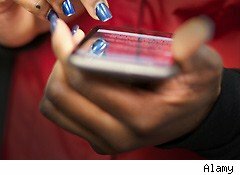 She adds that a lot of users will use the cell phone tools when they're home and in the vicinity of a computer; while this might sound surprising, if you think of how easy it would be to grab your phone while helping a child with homework or watching a favorite TV show, the appeal begins to make sense. Customers also like being able to check their balance while shopping, she adds. "We learned that when they're in a store environment, before they use their debit card, they often check their balances with a text message." In the future, Watson says customers can expect mobile apps to take advantage of more smartphone tools such as the GPS (for locating nearby branches or ATMs) and the camera. Some apps already incorporate these kinds of functions; Bank of America's app includes geo-location, and Chase's app lets the user deposit checks by taking a picture of it. In addition, banks are already experimenting with the integration of social media into the mobile banking arena. Citi, for instance, launched a service last year that lets customers send messages via Twitter when using that bank's mobile browser. "Over the course of the next few years, we're going to see substantial growth. What people will demand is increased functionality on all devices," Johnson predicts. "Mobile is becoming almost interchangeable with online banking in terms of functionality. The phones have a much higher level of sophistication."